By now, the history of the Grey Friars and its role as the burial place of King Richard III is widely known, but what happened after the friary closed in 1538? Over the next 30 years the church was pulled down and the remaining buildings were left to gradually decay, providing a useful quarry of building stone for Leicester’s inhabitants. The site passed through a number of owners who sold off everything, including all the mature ash and elm trees on the site (3s 4d), until in the late 16th century it was acquired by Robert Herrick. Robert Herrick. Image credit: Leicester Arts and Museums Service. Herrick came from a prominent family of wealthy ironmongers in Leicester. Born in 1540, just two years after the friary closed, he became a town councillor in 1567, eventually following in the footsteps of his father and uncle as Mayor of Leicester, holding the position in 1584, 1593 and 1605. He was also a Justice of the Peace, an alderman and MP for Leicester in 1588. He died in 1618, aged 78, and was buried in St Martin’s church (Leicester Cathedral today). 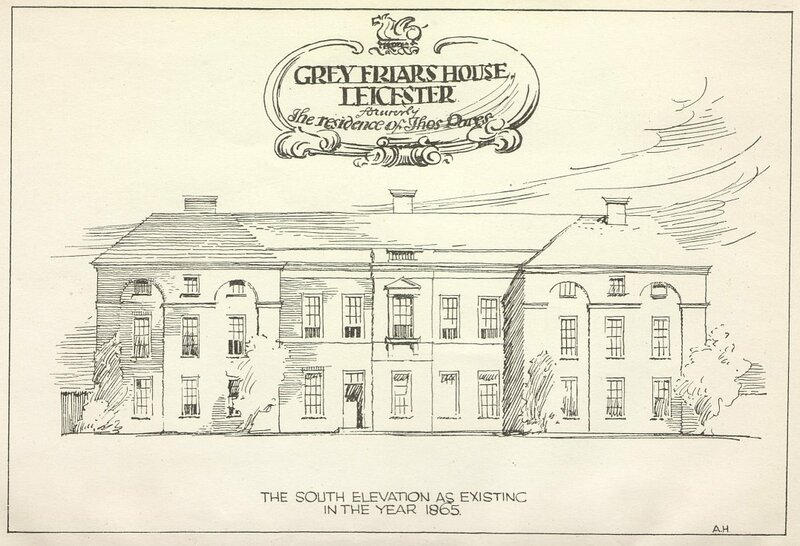 Following his acquisition of the former friary’s grounds, Herrick built a large mansion house on the plot close to Friar Lane (today the site lies beneath the modern street called Grey Friars). The remainder of the land was occupied by gardens. Greyfriars House remained in the possession of the Herrick family until 1711, when Robert’s great-grandson, Samuel Herrick, sold it. In the following decades much of the property was divided and sold off for development. What form Herrick’s original house took is unknown. One thought was that it might have incorporated parts of the friary when it was built. Monastic conversions after the dissolution are well documented and at Leicester Abbey the gatehouse was incorporated into Cavendish House in the late 16th century. However, the 2012 and 2013 excavations on the site have shown that it was built away from the friary’s church and cloistral ranges, although it cannot be ruled out that Herrick adapted ancillary friary buildings for his mansion. An extract from Thomas Robert’s 1741 map of Leicester, showing the grounds of the ‘Gray Fryers’. On Thomas Robert’s 1741 map of Leicester a series of incised lines on the engraving plate appear to show Herrick’s house. These have none of the well delineated neatness of the rest of the map and may be a later addition, or may have been transcribed in error by the engraver from Robert’s survey notes; however, they appear to show a series of buildings clustered in the corner of the site. Of particular interest are two ‘towers’ spaced closely together on the friary’s boundary. These could be evidence of a medieval gatehouse on the site of the later mansion. Robert Herrick’s mansion c.1867. 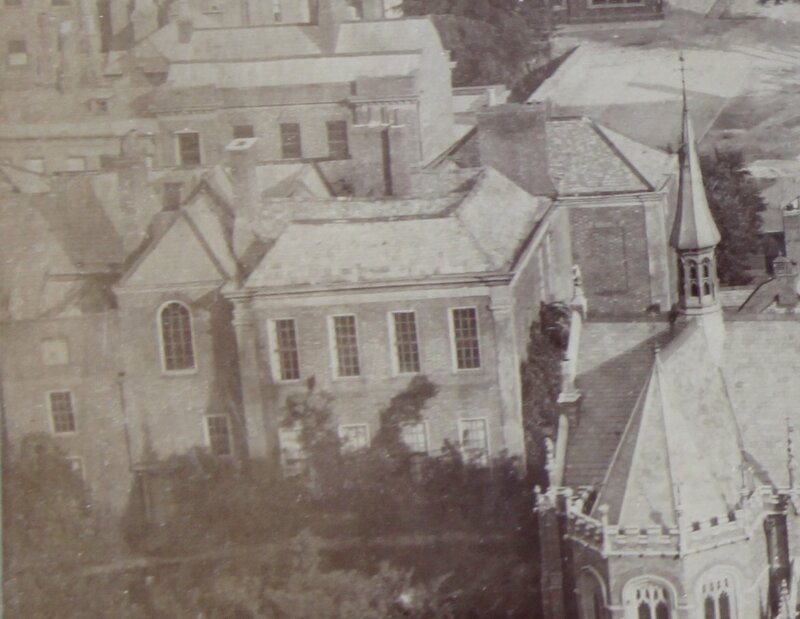 Photo taken from St Martin’s steeple, showing the rear of the mansion. Image credit: Leicester Record Office. In 1776, Herrick’s house was purchased by Thomas Pares, a local attorney-at-law and banker. Pares greatly enlarged the property, adding two extensive wings to the frontage. At this time it faced Friar Lane behind a large forecourt, with a walled garden extending back to Peacock Lane. It was considered one of the finest houses in the borough with one local noting that few other dwellings in the town were as desirable. The front of Greyfriars House after Thomas Pares alterations. Image by Albert Herbert, from Charles Billson’s ‘Leicester Memoirs’ (1924). Pares sold on the house in 1824 and by 1886 it had been divided into two residences. Finally, in 1871 it was demolished and the site cleared and in 1873 a new street, Grey Friars, was laid through it with the remaining land being sold off for commercial development. The site of Greyfriars House today.